There's a digital clock mounted above the door of Dr. Frank-Steffen Walliser's office counting down the days until the launch of Porsche 918 Spyder. It's a constant reminder of what Walliser and his team have been tasked with. 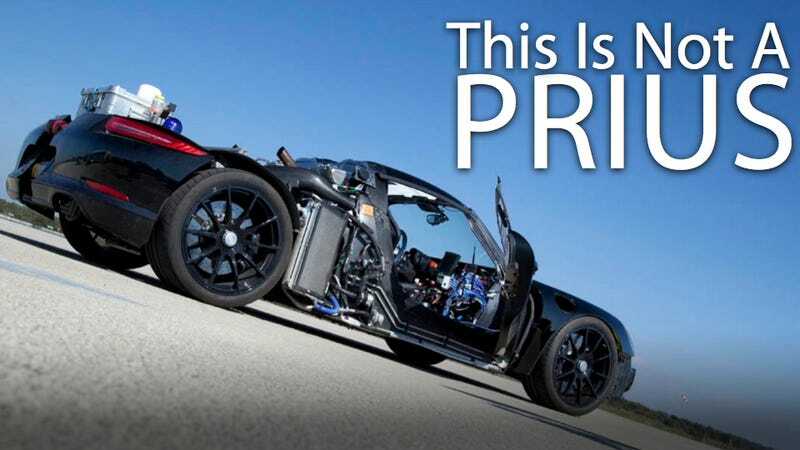 They're reinventing the supercar for the 21st century and we've traveled all the way to the high-security Nardo Test Track for an exclusive ride in the world's first plug-in hybrid supercar. This is most definitely not a Prius. Granted, it doesn't look like much right now. The original concept debuted two years ago at the Geneva Motor Expo and stole the show. Within months the Porsche board approved the project for production and engineers have been working overtime ever since. The 918 prototype you see here was in bits and pieces just a few weeks ago, and it's one of only three in existence. The Porsche team assigned with 918 development arrived in Italy in early January and furiously began testing all the components before slapping together an assortment of chopped and mismatched 911 bodywork to get it ready for the track. And us. Few outsiders get access to a vehicle this early in the development process – not even a cheap econobox, let alone a next-generation halo vehicle in Frankenstein form. But Porsche wants to show off what it's been up to and give us a taste of how it's reworking the recipe for world-beating performance. The formula for the 918 starts in stereotypical supercar fashion: mount a race-bred V8 amidships that sends power to the rear wheels. In this case, Porsche pulled a variant of the 4.6-liter V8 originally fitted to the three-time ALMS LMP2 Championship-winning RS Spyder. That engine put out a comparatively paltry 503 horsepower, but fitted to the 918, output is up to 570 hp. That figure is before you account for the 918′s two electric motors, and it's also where the similarities to past supercars ends. Abruptly. As opposed to most engines, the eight cylinders' exhaust outlets exit in the middle of the V, driving spent hydrocarbons out and over the engine into a muffler fitted atop the engine. That means heat in the engine compartment is kept to a minimum and – in an ingenious bit of form following function – a duo of exhaust outlets protrude upwards like two titanium trumpets signaling to the heavens. And it gets better. The 918 Spyder is a full parallel hybrid, with a 90 kW electric motor sandwiched between the engine and seven-speed transmission. Easy enough for a Toyota, but Porsche takes things three steps further. Another 80 kW electric motor is mounted on the front axle, powering the two front wheels and effectively making the 918 all-wheel-drive on-demand. That motor alone is good enough to get the 918 up to speed and driving around town on just electricity for 16 miles, but the combination of the two electric motors – on their own more powerful than the 1974 911 Turbo – and the mid-engine V8 singing at 9,000 rpm brings total output up to 770 hp, with an even more impressive 553 pound-feet of torque available across the rev range. Flick the steering wheel mounted switch into "Hot Lap" mode and in third gear Porsche claims you'll be thrusted forward with an overboosted total of 700 lb-ft of twist. That's good for a zero to 60 mph run of less than 3 seconds, 124 mph in less than 9 seconds and on to a top speed of 202 mph. And if you've got enough juice from the liquid-cooled, lithium-ion battery pack, you can hit 90 mph without using a single drop of fuel. Topping up that 6.8 kWh battery pack mounted behind the passenger compartment will take around six hours on a traditional 110-volt outlet, but Porsche will supply owners with a quick-charging setup that will reduce that time to 2 hours. Engineers we spoke with also mentioned that they're working on an even more robust charging setup that could bring that time down to 20 minutes, because, in their words, "Porsche wants to do everything faster." But the enemy of fast is weight. It's something Fisker learned the hard way with its nearly three-ton plug-in hybrid Karma and it's been nothing short of an obsession with the 918′s engineers. The entire chassis is a mix of carbon fiber and aluminum, including the passenger compartment and associated crash structure, which weighs in at a scant 485 pounds. Carbon fiber construction has come a long way since Porsche's last super car, the Carrera GT, and Porsche illustrates that by pointing out that the passenger tub of the GT took five days to make. Today, they can crank out five 918 tubs a day thanks to new innovations in composites and assembly methods. All told, the production version will tip the scales at less than 3,700 pounds – not bad for something packing a brace of batteries – but more importantly, nearly 80-percent of the weight is below the centerline of the car, giving the 918 the proper amount of grip to match it's hybrid-electrified go. All this sounds phenomenal until we realize that due to the lack of bodywork and its associated affect on grip and downforce, today during testing, the engine/motor combo is only configured to output 50-percent of what's available – a mere 400 hp and a redline of only 6,000 rpm. More frustratingly, because of instability at speed, our ride will max out at around 80 mph. But getting up to that speed is the interesting part. We strap into the carbon fiber bucket seat on the passenger side, a five-point race harness holding us tightly inside the sparse cabin and our posterior a scant 10 inches off the ground. One of the lead engineers flicks a few toggle switches on a makeshift aluminum panel below the windshield and selects one of five driving modes. The first is "E-Power", the all-electric setting, and a second later he nails the throttle to the floor and we're whisked up to speed in near complete silence. Acceleration is rapid, but far from brutal, with the only noise coming from the massive tires scrubbing the tarmac and wind rushing around the cobbled together body work. A hundred yards down the track, he bypasses the standard "Hybrid" mode, which blends electric and engine power for optimum efficiency, and sets the system to "Sport Hybrid". The mid-engine V8 bursts to life and it sounds like the Cookie Monster is shouting in our ear through a megaphone. Another matting of the throttle has us maxing out at our engineering-imposed top speed in seconds, at which point our pilot slams on the carbon-ceramic brakes and flips a quick U-turn. A moment later we're back up to speed and doing a flyby passed the assembled engineers before the driver expertly flicks the wheel left and right a half-dozen times. With the weight so centralized, body roll is completely and utterly nonexistent. The 918 stays perfectly flat with each undulation, the adaptive dampers working in concert with the torque vectoring traction control and rear-wheel steering. Another U-turn and we're back in the pits, more impressed with the overall balance than the sheer force of the 918. But then again, we're only working at half its potential. Things can only get better once the finalized body work is applied and the engine/motor combo sorted out. But Walliser and his crew have time, as the first of 918 production examples won't go on sale until September 18, 2013. This story originally appeared on Wired: Autopia on March 19, 2012, and was republished with permission.